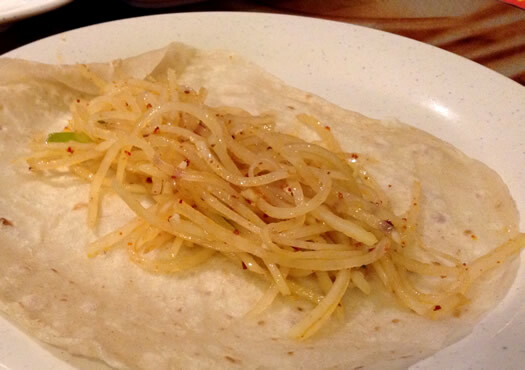 Spicy, crunchy, and wrapped in a pancake. For an area of its size, the Capital Region boasts an impressive array of Chinese restaurants, strong in both quality and diversity. And it's only getting better: Northeast Dumplings House opened just two months ago in Albany and offers not just tasty dumplings made in-house, but small Sichuan delights. Judging from the lack of traffic there on a recent weekend evening, it seems most are unaware of what this new restaurant is offering. That needs to change. 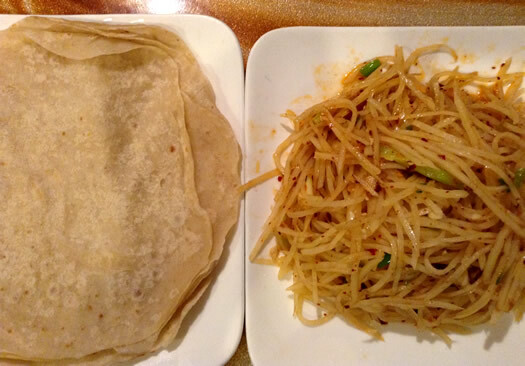 The Spiced Potato with Hot Pepper, served with a pile of the restaurant's "special pancakes," turned out to be a real surprise: complex in taste, it's a dish that satisfied my longing for authentic and delicious Sichuan food, one type of regional Chinese cuisine that had been previously lacking in our area. Sichuan cuisine isn't absent from area restaurants; it's represented by popular dishes such as Kung Pao chicken. But as Fuchsia Dunlop writes in the introduction to her excellent cookbook Land of Plenty, "Szechuanese cooking is one of the great unknown cuisines of the world. It is legendary in China for its sophistication and amazing diversity, but known in the West only by a few famous dishes and its 'hot-and-spicy' reputation." Northeast Dumplings House showcases that diversity, even though its menu is fairly small outside of its dumpling offerings. The menu is devoid of any rice dishes, and the dish I want to talk about here features potatoes, which aren't often thought of as being a part of Chinese cuisine. I had planned on ordering the Sliced Potato with Hot Pepper at Northeast Dumplings House for $3.99, but before that asked about the "special pancakes" that were just above them on the menu for $4. Our server said that these went with the potatoes, and the proper way of eating them was to place some potatoes in the middle of one of these thin pancakes and then wrap it up and eat it. This might seem strange at first, but it's not all that different than a knish from Jewish cuisine or a dosa you might find in an Indian restaurant. And in terms of texture, the potatoes inside the pancake at Northeast Dumplings House might be the most satisfying. That's because these potatoes are shredded and cut to the size of matchsticks. Stir-fried, they retain their crunchiness. The Sliced Potato with Hot Pepper can certainly work on its own, but they do work quite nicely inside the soft and slightly chewy pancake. And in terms of the taste, these potatoes provide a surprising jolt of flavor for what appears to be such a simple dish. There is the heat that comes from the chiles, but it's moderate and allows for other flavors to assert themselves. Most notable among them is garlic, which seems to be liberally used throughout many of the dishes I sampled at Northeast Dumplings House. There is also the pleasant sourness of vinegar present in these potatoes. While some recipes call for Chinkiang (black) vinegar, I believe Shaoxing rice wine or sherry vinegar was used here. And to add both texture and taste, there were slivers of scallions interspersed with the potato slices. In all, the serving of potatoes was enough to spread among the eight pancakes and still have a bit left to scoop up with chopsticks afterward. 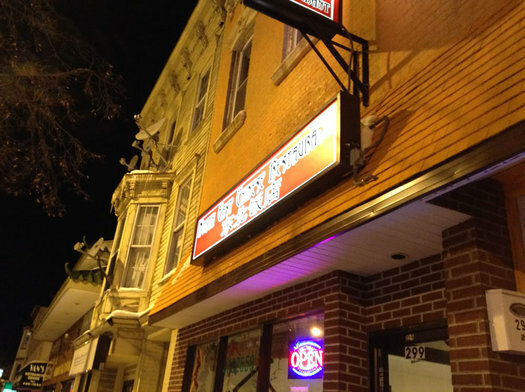 Northeast Dumplings House occupies a modest storefront on Central Ave that formerly housed CCK Chinese Restaurant. The interior is highlighted by the large window at the rear of the restaurant that allows patrons to watch as the chef goes to work. It's a fun place for a meal, particularly when sharing with others so you can sample as many items as possible. The dumplings come steamed or fried as orders of 15, and there are numerous side dishes -- like the sliced potatoes or any of the buns or pancakes offered -- that are best when divided up. You can also get a sack of 30 frozen dumplings to take home and cook yourself. Yes, there are many quality Chinese restaurants in the area to choose from, but Northeast Dumplings House shouldn't be a forgotten member of the pack. They -- along with their larger sister restaurant, the nearby Northeast Chinese II -- are bringing exciting new options to the Albany area. China is a pretty large country, after all; it's nice to see another of its many regional cuisines represented well here. Looks so good!! Just the place to give up on the new year's diet. Anyone have any takeout experiences with them? Out of curiosity, why not eat in? No food tastes as good after it travels as when it's hot out of the kitchen. This place looks amazing. If I were still in town, I'd be there eating dumplins every chance I could get. Boiled lamb dumplins... I'm coming for you! @Daniel: Because there are some nights when all I feel like doing is getting right into my pajamas, watching Jeopardy with my cats, and eating Chinese Take-out. We enjoyed this dish last week. Our server asked if we wanted him to heat up the potatoes as they are usually served cold. I asked how he likes to eat it and he said "definitely cold," so we took his recommendation. I found it to be light and refreshing. It looked like it had a lot of chiles, but it was mild enough to be gobbled up by my 16 month old. We also tried the braised pork soup from the specials board. The meat was pork belly and the broth was rich and deeply meaty. Combined with the thick hand-made noodles, it was the perfect meal for a bitter cold day. The pork and chive dumplings were quite nice, but were outshined by the soup and pancakes. Why is it called Northeast Dumplings House if it is known for Sichuan food? Sichuan is considered to be in the southwest part of China. @D: You're right about the focus of the restaurant actually being on the food of northeastern China. This dish is a variation--basically they didn't use Sichuan peppercorns--on a Sichuanese dish, and the restaurant noted somewhere (I can't recall if it was on the menu or elsewhere) that they had some Sichuan specialties. Hence my references to the Sichuan aspects of NE Dumplings House. I see. 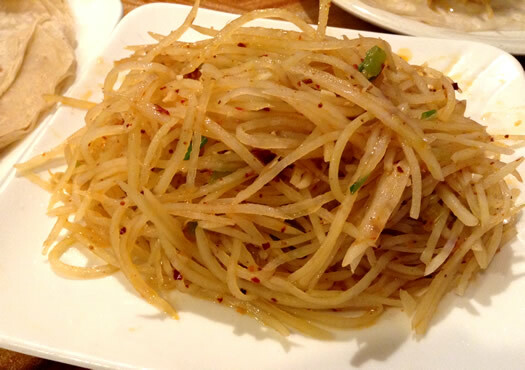 Generally I have heard of 'suanla tudou si' referred to as a Northern Chinese dish. However I believe these days it is popular throughout much of China, Sichuan being no exception. I will have to try making it with Sichuan peppercorns sometime. I like the effect they have on simple dishes like this, it is really a unique taste. If you make a great dumpling i will follow! The former Dumpling house in Colonie had the best dumplings my sister,and i had ever tasted. The owners were getting on in age,and they had to face the problem of the road being torn up all along that stretch in Colonie . They sold their property to a dance studio, and broke our hearts. The location of this new dumpling house is very handy to sister, and me. Can't wait to try it! The spiced potato with hot peppers and pancakes was really yummy. Make sure you venture over there soon. I'm really interested in trying this place. But I'm hoping someone else will go and order the Bull Paddywack (#44 on the menu) and report back. Also, while the dumplings look great, 15 of any one kind is a bit much. I wonder if they would let you order an assortment? @Amy - bull paddywack is beef tendon, but when I went they had it crossed off their menus. Which is a shame, because almost no restaurants make this dish with any sort of regularity in the area, and it's a chewy, meaty delight of a dish.